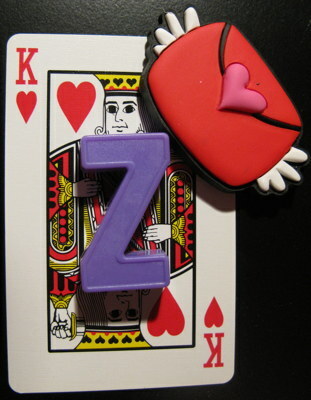 The following is a sequel to Ten of Hearts: Double You. A fair-haired man enters and plays a flashlight over the room. He stops dead as the light finds the face of the oldest of us. I fight to open my eyes against the burning light. Before it blinded me, I saw something tantalisingly familiar in the man’s gait. When my eyes finally consent to staying open, they see only a bright light against darkness. The light falls with the sound of a collapsing body, and spreads a gloomy half-light across the floor. I rush toward the unconscious intruder. It’s Jack, or almost Jack… he seems older. I stroke his forehead until his eyes also manage to open again. He looks at me as though he is lost in a familiar place. The others’ reactions remind me that we are not alone in the room. “Get away from him!” I squeal. I’m eight. I don’t want the big me to be killed. I run toward her and try to drag her away, but she doesn’t move. A six-year-old me comes to help. “What?” This time it is the man who is surprised. I look at him defiantly. “He tried to kill me first! I’m a good guy… I think,” he protests. I relax my grip, but stay at her side. We listen to the rest of his story. “About a year and a half ago, I woke up to an old man trying to inject me with something. We struggled, and eventually I injected him with it. He went to sleep immediately. I watched him sleeping. He looked like my grandfather. God, it was awful, thinking I’d killed my grandfather.” His voice is beginning to quaver. “So I tried to wake him, I tried so hard…” his words clump into sobs. We watch, trying to make sense of the new layer of strangeness. Trying to remember our lives, trying to get back to them. “But now… I went to heaven anyway…” Jack manages to squeeze past the lump in his throat. The youngest of us starts crying with him. I see my worst fears in his eyes. “While I was fighting the man, he said… he said, ‘you don’t know how much you want this. '” He paused to find enough calm air to speak again. “After it was over, I realised he was right. You were already dead. I’m so sorry…” Jack buries his face in my lap and weeps. For a while we just sit there, watching him cry. He is a stranger to most of us, but we can’t help feeling his grief, and mixing it with own for our lost lives. “Hey, were you in virtual reality too?” I ask. I’m ten, and I’ve been thinking hard to take my mind of my sore knee. It hasn’t really worked, but I have some ideas. “I don’t think… I don’t think people wear things like that in heaven. Hell, I don’t even believe in heaven! I think you’re right! Let me have a look at that.” He speaks with a new-found jubilance. He gets up and walks toward me. He sits down next to me and starts examining my suit. I scream in pain as he prods at my left knee, and instinctively bend it away from him, which makes it hurt even more. Some of us cry in sympathy, some in surprise. “She has a broken kneecap. Do you have any painkillers?” I say. At 18, I’m the second eldest. “Already?” I remember suggesting the idea to him; it would be a giant art project, an adventure in the past. I walk with him toward the door. I feel a gentle tension pulling me back inside, the tingling I used to get at the top of my head when I ran too fast and breathed too little. The cable linking me to the ceiling is fully unwound. Jack looks up at the cables for the first time, and follows them up with his flashlight. The light is too weak to reach the top. “Wow,” he gasps. “Okay, I’m going to get some stuff. I’ll be right back,” he promises as he leaves. Here we are again, ten hearts, one name, alone with ourselves. Twenty hazel eyes staring into the darkness. A few more facts and millions more unknowns. Here we are. Ten hearts, beating silently. Twenty legs, some abruptly collapsed onto the floor. Twenty hands, grasping at lost sensations. Ten heads, linked to flexible cables suspended from above like the strings of ten marionnettes. Twenty hazel eyes, staring into the darkness. on a screen, watching the world whiz by from a swing, watching the teacher form the letter W on the blackboard, tracking an approaching ball, streaming tears from the pain of a broken knee, gazing down at polished shoes on the school stage while the students clapped, closing in embarrassment for a first kiss, glazing over in front of an educational video, closing in rapture during an embrace with our soulmate, opening wide in terror. The cries of the youngest hit our ears before our eyes have adjusted. A sound made by one, forgotten by some, not quite familiar to others. We begin to see each other, ourselves. Some recognise past selves, some gape at the slow recognition of future selves. Some are too young to know that the others have separate thoughts. We look at each other questioningly, trying to find the right words to say, and wondering whether we need to say them once they’re found. “Are you me?” I say. I’m twelve, nearly thirteen. I think I wished myself here, to escape the humiliation of standing in front of assembly with my art prize. All are unsure. Those close to each other in age answer similarly. All who answer answer positively. We are Cat Diesch. We were born on October 10, 2010 to Rose and Macy Diesch. We have no siblings. We enjoy painting, fireworks, and nectarines. We are sitting in a dark room with nine other versions of ourselves, at different ages. More questions follow. Did we travel through time? How can we travel back? Did we die? Did we all break our kneecaps at ten years old? Only the last gets an answer, so we quiz each other on our lives. We all lived the same one. We each lived it until August 10. Each in a different year, always two years apart. The younger ones are warned not to play rugby, for a broken kneecap is painful. Very painful. I am ten, and though my world disappeared, my knee still hurts, and my eyes are still streaming with tears. “I want to go back to the hospital,” I plead. Nobody says anything; we know that we have no answer. Less than an hour ago my leg was in a splint, now it is covered with the same smooth, squishy black fabric as the rest of our bodies. As an older me comes to comfort me, I notice the cord linking her to the ceiling unwinds so that she is free to move toward me. The older ones smile at the spark of a much-enjoyed book lighting up their memory. “Nothing like this.” I say. I’m eighteen. I tinker with the graphics for the virtual reality software my boyfriend is making for his Master project. He just uses goggles, earpieces, gloves, and some basic neural stimulation. We ponder in silence for a while, watching the two youngest play together. Our thoughts are like ten flautists playing different tunes, each trying to make sense of the same shrouded score. “Did I stay with Jason forever?” I ask. I’m fourteen, and I know Jason and I are meant for each other. But after exchanging puzzled looks, my older selves burst out laughing. “Jason… oh my God, that kid? He was…” They stop when they see the look on my face. “And you end up with someone much better,” say the two oldest in unison. The click of a door interrupts our retrogressive reminiscence. 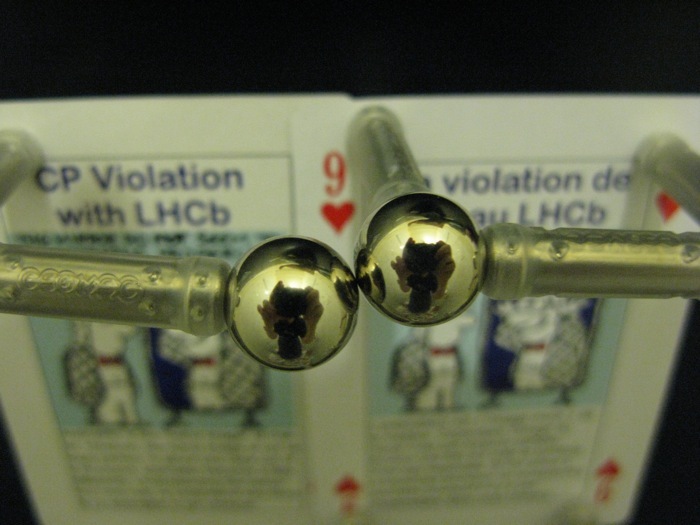 Nines of hearts featuring CP violation at LHCb: The mirror did not seem to be operating properly. Click to see a guardian Angela. The following is a story I wrote in 1996, unaltered except for one word. This week’s Thing is below it. I had always assumed it was me – with the long brown hair, hazel eyes, and the line of freckles joining two rosy cheeks. Indeed, that corresponded to the way others hazily described me. The image perfectly mimicked my actions, wore my clothes in the way I imagined they looked on me. I had no reason to doubt that it was my reflection that I could see, as she looked convincingly like photographs of myself. Ironically, it was my kitten, Angel, who led me to discover what I am sure I was better off not knowing. She was given to me on the birthday which I have mentioned, a cat such a pure white that the name Angel immediately sprang to mind, and stayed there, when I first saw her. The kitten did not seem to have such an angelic temperament, however. As soon as I released her from the box she had been brought to me in, the distressed kitty leapt at my face, giving my cheek a scratch which would have been very painful, had it been caused by a fullgrown cat. Quickly I rushed to the bathroom to inspect the damage in the mirror. I was relieved, though a little puzzled, to see that the scratch had not even marked my face, and went back to my friends in the lounge. “Ooh, that’s a nasty scratch, Hannah – we should put some Savlon on that,” said my mother. By this time even my friends were beginning to look at me strangely, so I didn’t say anything more. Before I went to bed that night I looked in the mirror again, but still no scratch had appeared on the image. The next day – Sunday – I spent in front of my mirror, examining the image and comparing it to photos. I noticed several subtle differences – her eyes were a slightly different shade, she had a few extra freckles. While I wasn’t looking at the mirror my mind was occupied solely with trying to figure out who she was. Did I have a twin who had died at birth, and now watched me through the mirror? My mother assured me that no, I had never had a twin sister, and wondered why I had asked. I dared not tell her. So who was it? Soon I became very uncomfortable around mirrors – I did not like the thought of her watching me. By the time I was fifteen my thoughts were permanently filled with dread, the awful feeling of being watched. I started to plan shopping trips so that I could pass as few reflective surfaces as possible – my friends thought I was weird, and soon they were not my friends. I was relieved at this – no longer would I have to think of excuses not to go out. I managed to completely avoid seeing the image for eight months. At times I managed to seem normal. but I was always scheming to avoid her seeing me. My mother sent me to a psychiatrist, but I ran away from there when I saw the reflective silver stars on her walls – meant to be cheerful but instead terrifying. They were only peep-holes for her to watch me through. Then one day, when I was seventeen, I came home to see my mother had done spring-cleaning. The windows sparkled with a near-transparent image of the spy. Even the netball cups I had won before discovering her were displayed on the mantelpiece, their newly-cleaned silver proudly reflecting what I used to think was me. I ran to the sanctuary of my mirrorless bedroom. She looked straight at me, taunting me with a replica of my own paranoid face. My mother had cleaned my mirror for me. I threw a sneaker at the mirror to smash it. She continued to watch me, the face more disfigured by cracks in the glass. I grabbed a sliver of it and thrust it into my chest, preferring death to this life tormented by the devil’s spy. As I slipped into unconsciousness I heard her speak to me. I had always assumed it was me – with the long brown hair, hazel eyes, and the line of freckles joining two rosy cheeks. Indeed, that corresponded to the way others hazily described me. The image perfectly mimicked my actions, wore my clothes in the way I imagined they looked on me. I had no reason to doubt that it was my reflection that I could see, as she looked sufficiently like photographs of myself. It started with a gift. My birthday had been going perfectly, until I opened the last box, a box which been jiggling in anticipation all by itself. Inside was a kitten… perfect, white, and dead. I rushed to the bathroom to cover my imminent sobs. But my shock was met by a second shockwave when I saw myself in the mirror. I had a scratch on my cheek, which was bleeding. I went back to the lounge to show my mother. My parents exchanged worried looks, and I wondered if they’d thought I’d hurt myself while doing something naughty. “But I’m not pretending,” I protested, moving my hand to the affected cheek. “I…” I stopped speaking when I felt the smooth, unbroken skin. “Look, how about we all have birthday cake and try to forget about it for now?” said my dad. So I pretended to forget. It was easy to let my family think I was upset about the cat, and not the phantom scratch. Before I went to bed that night I looked in the mirror again. The scratch was still there, but already starting to heal over. I spent all the next day in front of my mirror, examining the image and comparing it to photos. I noticed several subtle differences – her eyes were a slightly different shade, she had fewer freckles. And she had that scratch. I wondered what had happened to her. I hoped that it did not hurt her too much. I hoped that she wasn’t my own future. So where did she come from? I asked my mother if I’d ever had a twin sister. She looked at me the same way she had when I’d asked about the scratch, and said no. I knew better than to continue and risk being sent to a nuthouse. I told her not to worry about getting a new cat. After that, my reflection always looked a little scared, and maybe I did as well. It sure felt weird to look in a mirror and know that there was somebody else looking into my world. I wished I could ask her who she was, what was troubling her. A few times I thought I saw a white cat in the background. Had my kitty escaped into her dimension, or was I subconsciously so upset about her that I saw her everywhere? As time went on, I began feeling increasingly uneasy, even when I wasn’t looking in a mirror. I kept having the feeling that something wasn’t quite right, something in my peripheral vision that escaped my attention. It was my little brother Bob who first realised what it was, as we walked past some shop windows one Saturday. “And you’re a tasty little troll!” I retorted, leaping toward him in mock menace. He bolted with a shriek of true terror, bawling and screaming until he was out of sight. It took us fifteen minutes to find Bob again, and another half an hour to coax him out of his hiding place. When we got home, he raced to his room. After much pleading, he eventually let me in. He was wearing two sets of rosary beads and clinging to a Bible. I couldn’t help laughing, and he almost joined me with a slight smile. I sat as close to him as he would allow. The fear returned to his face, and he pointed to his mirror. When I saw his pale face in the mirror, I felt my own face go white. I felt it, but did not see it; in the reflection, Bob was scared and alone. I had no reflection. “I swear I’m not a vampire,” I said. I explained what had happened. I’m sure I was even more relieved than he was that the truth was finally out. He seemed especially happy to hear that my doppelgänger had the cat. “Can I tell you a secret?” asked Bob. “Sure… if you can trust your secrets to a vampire,” I grinned reassuringly. I stared at him, wide-eyed. It was a scary black hole of a question, which got deeper as reflections kept disappearing. Soon my bedroom mirror showed only darkness. I was afraid to touch it, lest I be drawn into a dark mirror-world. I longed to see her again, to reassure both of us that we were not alone. I grew much closer to my brother, who would tell me whether I’d combed my hair straight, and let me sit with him and his own reflection when I missed my own. The secret stayed between us. I stayed away from mirrors in public, and found that most people did not notice the missing reflections in other shiny surfaces. One day, when I was seventeen, I came home to see my mother had done some spring-cleaning. And it was more than just a clean. The windows, my trophies, everything was so clean that I could see my reflection in it. I rushed to my room to at last get a good view of my angel, afraid that she would soon disappear again. There she was, looking so scared that I tried to reach out and comfort her. She responded by throwing a sneaker at me. The mirror remained intact, but the image broke into shards, reflecting pieces of her strangely unfamiliar bedroom. I tried to make sense of the images speeding across one shard, until I saw the end of it reflecting what was unmistakably blood. I watched as the blood took over the rest of the shard, and sprayed onto the others. I watched her beating heart approaching me from the mirror. Too late, I realised who needed to protect whom. Too late, I told her what we both needed to hear. And for one last time, the mirror was accurate. As her heart stopped beating, my heart broke.